Please refer to our stock # 1993 when inquiring. 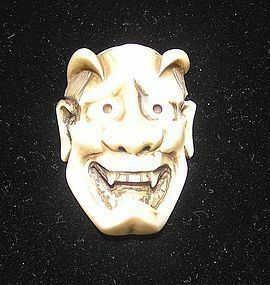 Three Japanese Ivory Netsuke heads from the Noh Theater, Japan, ca. 1920. Each incised with various characters of the theater and signed on reverse by artist. All in excellent condition with no chips or cracks. Size of each is approximately 1 3/4" high. According to the Fitzwilliam Museum, the netsuke is a form of miniature sculpture originating in 17th-century Japan. These often elaborately carved items were designed to function as 'toggles' for the silk cords upon which Japanese men strung their pipes, purses or writing implements. Traditional Japanese clothing does not include pockets. Instead, items are suspended from a belt by means of a cord. A toggle (netsuke) at the end of the cord prevents it from slipping through. The types of sagemono (suspended objects) used in this way include medicine containers, pipe holders and tobacco pouches. In the 18th century and early 19th century, netsuke and sagemono were important components of Japanese costume, and were symbols of social status. A well-dressed gentleman in Japan seldom appeared on the street without a carefully considered ensemble of netsuke and sagemono suspended from the sash of his garment. The use of netsuke probably began in the late 16th to the early 17th century, together with inro (cases). At first, a simple piece of wood or shell was used to secure the sagemono, but soon netsuke evolved into wonderful miniature sculptures that drew their motifs from daily life, religious and mythological figures, animals and vegetables, images from fairy tales and the imagination, etc.